The active mass of a pure solid is constant irrespective of its amount and if a pure liquid is present in excess, its active mass is also constant.In both the cases we put active mass equal to 1. Molar concentration of a substance means mol L-1 of the substance which is obtained by dividing the amount of the substance in moles by the volume of the substance in litres. As density of a particular pure substance at a particular temperature is constant and molecular mass of the substance is also constant, therefore, molar concentration is constant. If Δn =0 i.e. number of moles of products = number of moles of reactants , Keq or Kp will have no units. 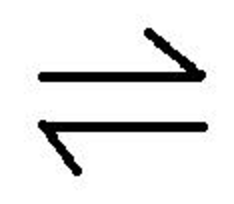 Δn =0 , Kc or Kp will have no units.